Located within WCI Communities' Gateway DRI; five (5) minutes from and immediately north of the Southwest Florida International Airport. 7.4 gross acres zoned General Office/Hotel/ACLF. Located at the north signalized intersection of Tamiami Trail (U.S. 41) and Old U.S. 41 with 540 lineal feet of frontage on Tamiami Trail (U.S. 41) with individual curbcut. Located at the southeast corner of Tamiami Trail (U.S. 41) and Old U.S. 41; with 625 lineal feet of frontage on Old U.S. 41. The Centre can be accessed directly from Old U.S. 41 and Strike Lane with additional access from Tamiami Trail (U.S. 41). 110 acres zoned CPD/IPD. 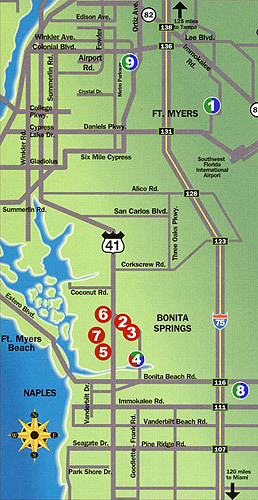 The Park's "in town" location provides over 8,200 lineal feet of road frontage with eight entrances along Old US-41. Additionally, the Park can be accessed from Tamiami Trail (US 41), via Bernwood Parkway at the northwest area of the Park. Buildings are 4,950 square feet each. IPD/CPD contiguous facilities located in the Bernwood Business Park. Enclosed, high security, outside storage facilities available. CPD zoning-Commercial, Retail, Restaurant and Professional Office Uses. Adjacent to the Pelican Landing Community, located directly on Tamiami Trail (U.S. 41) in the burgeoning growth corridor of Bonita Springs. Nearly 40,000 cars pass this site daily. CPD zoning-Commercial, Retail, Restaurant and Professional Office Uses. Situated just before the main entrance guard house of the Pelican Landing Community and adjacent to the Shoppes at Pelican Landing (Publix). Part of the Pelican Landing Community just south of signalized intersection of Pelican Landing Parkway and Tamiami Trail (U.S. 41). Quick access to Tamiami Trail (U.S. 41) via Strike Lane. 80 acres zoned MPD-Commercial, Office/Showroom, Industrial, Retail, Hotel and ACLF. A Publix shopping center anchors the northeast area of the Park. 40 acres zoned B-1 (City of Fort Myers) - Commercial out-parcels available. On Six Mile Cypress just north of Heritage Palms Golf and Country Club (1,450 units) and adjacent to Dunbar Middle School.